Children's Personal Sitting Bench. This bench is great for practical use around the house....if extra seating is needed in the living room or entry way or child's room. 13" height is perfect for a younger children, elementary school age. This bench comes fully assembled. Clean, sanded wood....ready for stain or paint. Fully Assembled. Solid PINE construction. Well-built. UNFINISHED wooden bench - ready for your own personal touch. Decorate, finish, or paint to your liking. 20"×11"×13" tall. We also offer this bench as a small '2-seater', a 28" version, slightly longer. Built-in 'shoe shelf'.....perfect for organizing/storing personal items. Made in Maine, U.S.A. Exclusive EarthBench product. 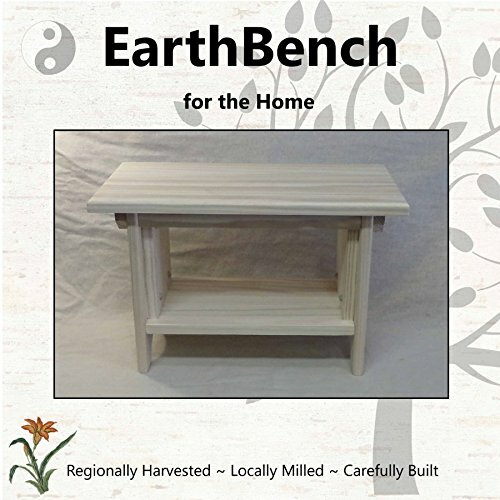 If you have any questions about this product by EarthBench for the Home, contact us by completing and submitting the form below. If you are looking for a specif part number, please include it with your message.